The University of the District of Columbia women's basketball team earned a 63-57 victory vs. Holy Family University on Saturday, November 17th at UDC Gym. Playing in front of a packed arena for a raucous UDC Homecoming crowd, the Firebirds (2-2), this afternoon, avenged their season-opening 46-point thrashing by the Tigers just eight days ago. HFU, a regional opponent from the Central Atlantic Collegiate Conference (CACC), fell to 1-2 overall on the season. 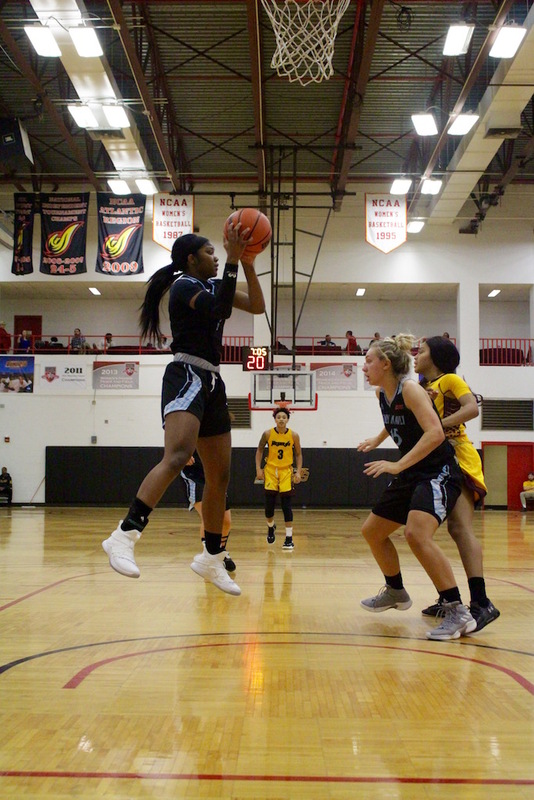 Sophomore guard Danielle Harrington led the Firebird charge with a career and game-high 18-point scoring effort, which included 14 points in the 2nd half and nine in the 4th quarter. She shot 4-of-5 from the field in the final period, including a clutch three-pointer from the left wing at a critical juncture of the game. Three other Firebirds scored in double-figures, including senior guard Mia-Alexis Lloyd with 14 points, five rebounds and three steals, senior guard Natasha Roy with 11 points, and junior transfer guard Etalyia Vogt with 11 points, four rebounds and two assists. Roy scored five of her 11 points in the 4th quarter, making 5-of-6 from the foul line, all in the final 31 seconds of the game. Holy Family, which led by as many as 12 points late in the 2nd quarter, featured three scorers in double-figures, including a double-double effort by guard Molly Masciantonio (16 points, 10 rebounds) and 14 points apiece by guard Jada Smith and forward Katie O'Hare. Smith also finished with a double-double, as she hauled in 10 rebounds and also had a game-high five steals. 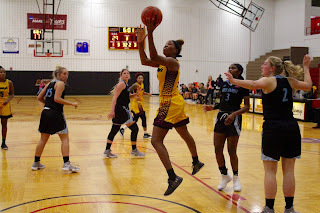 The Tigers raced out to an early 8-2 lead nearly three minutes into the action, but a 7-0 response by the Firebirds, capped by a Roy three-pointer at the 3:35 mark, put UDC on top, briefly, 9-8. Later, after six consecutive points by HFU, Roy knocked down another from long range to make it 15-12 with just under two minutes to play in the opening quarter. But the Tigers would control the lead, 19-14 at the end of the period. 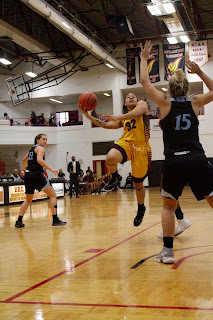 In the 2nd quarter, Holy Family out-scored UDC, 13-6 through nearly eight minutes of play, extending its lead to the largest margin of the day for either team, 32-20, with 2:22 remaining before halftime. 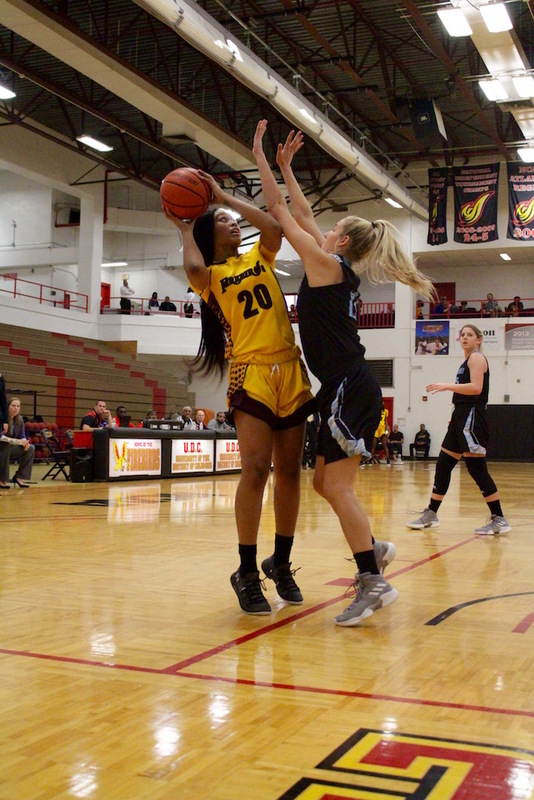 At that point, UDC closed on a 7-0 run, highlighted by five straight points to end the half by Vogt, who came up with a steal and a buzzer-beating three-pointer to spark the Firebirds just before intermission. Despite the momentum shift right before halftime and UDC's increased intensity to start the 2nd half, UDC still found itself trailing, 39-33 with less than four minutes remaining in the 3rd quarter. 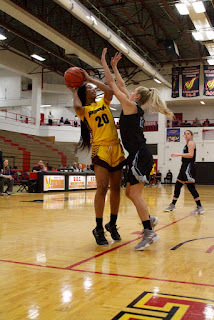 But Harrington's layup at the 3:46 mark kicked off a spirited, 8-2 surge by the Firebirds to force the first of only two ties in the game, 41-all, with just 39 seconds remaining in the period. Holy Family then knocked down 3-of-4 free throws in the final 15 seconds of the quarter to pull ahead, 44-41 at period's end. Not long into the 4th quarter, however, UDC would claim its first lead since the 1st quarter. Following a layup by Lloyd, Harrington hit her only three-point make of the day at the 7:55 mark to put the Firebirds in front, 46-44. The lead would change hands twice more following Harrington's three-pointer, but another layup by Lloyd at the 6:09 mark put the Firebirds ahead to stay, 48-47. Multiple times, UDC upped its lead to four, only to have the Tigers score a basket and cut it back down to a one-possession lead. With 31 seconds remaining and UDC ahead by three, Roy was intentionally fouled for the first of three consecutive crucial foul line appearances. Her first time up, she missed the first attempt, but made the 2nd, upping UDC's lead to, 59-55. Then, following a pair of free-throws at the other end by Masciantonio, she calmly sank a pair on her next trip to make it 61-57. 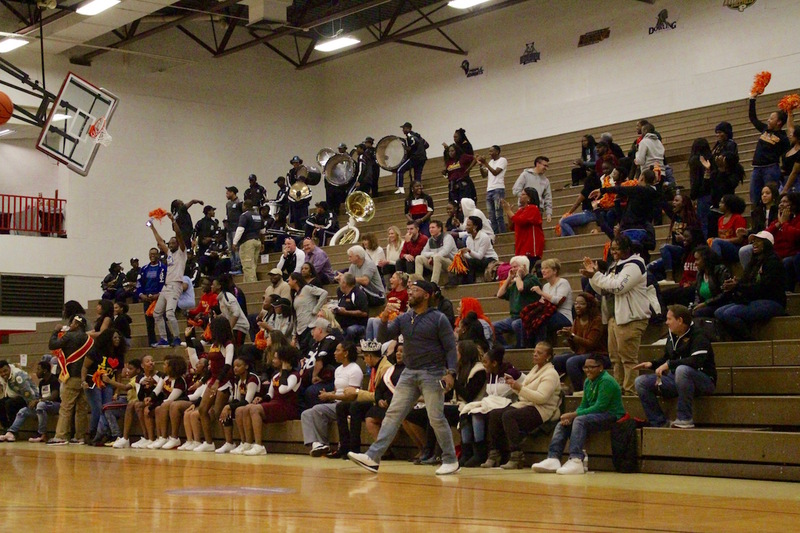 UDC then forced a Tigers turnover on the next HFU possession, and head coach John Nakpodia alertly called a timeout. The Firebirds then drew up an inbounds play to get Roy the ball once again, and when that play was successful, Roy went on to hit another pair at the line to ice the game at 63-57. 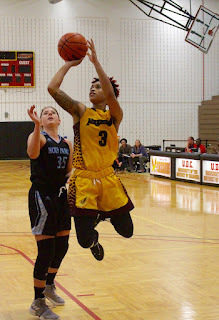 Next up, UDC will travel to Waterbury, CT to take on another CACC squad, Post University on Tuesday, November 20th at 5:30 PM.